After years of collaboration, this week our five organizations—Healthcare Is a Human Right – Maryland, the National Economic and Social Rights Initiative, Put People First! 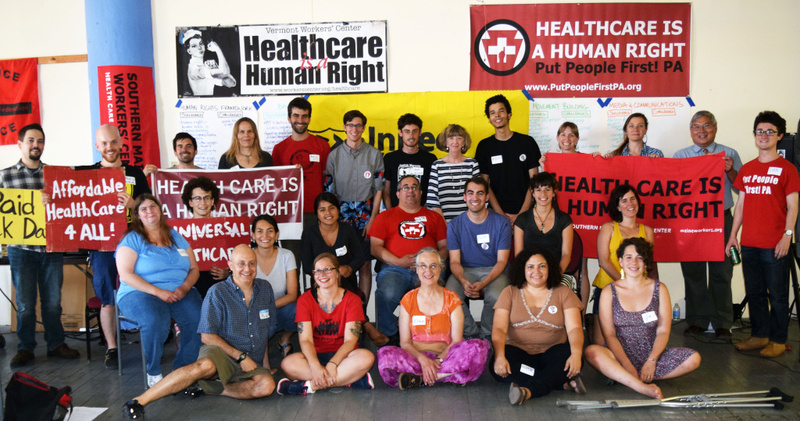 Pennsylvania, Southern Maine Workers’ Center, and the Vermont Workers’ Center—are coming together to officially launch the Healthcare Is a Human Right Collaborative. The Collaborative will enable us to better coordinate our work and connect nationally with our allies in the larger movements for universal healthcare, racial and economic justice, and human rights. Today, September 1, 2015, at 3pm Eastern / 12pm Pacific we’re hosting an online discussion of our campaigns and our collective work, during which we’ll respond to questions from the audience (sign up to join the discussion here). 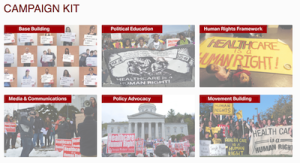 We’re also launching a new website, healthcareisahumanright.org, which features a Resource Library and Campaign Kit offering over 200 campaign resources. In June, the member organizations of the Collaborative gathered in Philadelphia for two days of learning, relationship building, and strategy sessions on the key areas of our campaigns: base building, leadership development, the human rights framework, media and communications, policy advocacy, and movement building. The Southern Maine Workers’ Center (SMWC) has spent the summer solidifying its base in Portland and reaching out into surrounding counties. 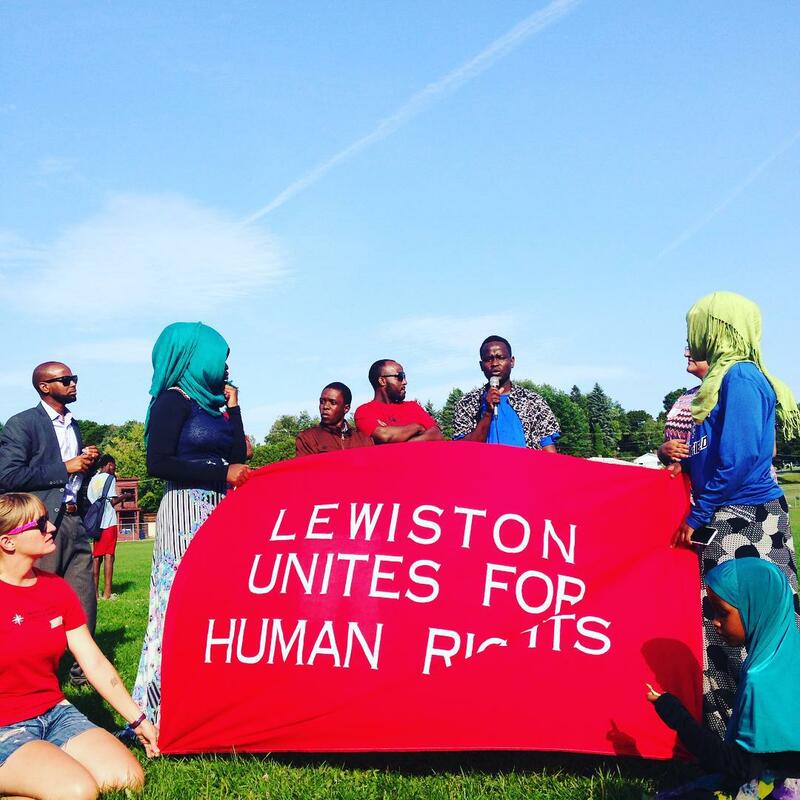 On Saturday, SMWC teamed up with fellow grassroots organization—the New Mainers Public Health Initiative, Neighborhood Housing League, and Maine Immigrant & Refugee Services—to host the first Human Rights & Health Fair in Lewiston. 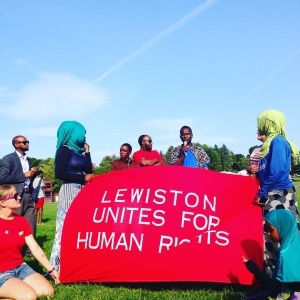 The fair focused on the human rights to healthcare, education, and housing—all issues that directly impact Lewiston residents’ quality of life on a regular basis—and featured a soccer tournament, food, arts and crafts, music, a storytelling booth, and a free health clinic with basic screenings and testing for HIV and Hepatitis-C. Speakers addressed human rights concerns in the community, and included local middle school students who recently completed a month-long human rights organizing project with Cait Vaughan, SWMC’s HCHR organizer. “The fair was a great opportunity to celebrate the hard work of grassroots community members and build relationships for the long-haul organizing fights ahead,” says Cait. Members of the HCHR campaign marched in the Portland Pride parade in June, connecting the human right to healthcare with LGBTQ liberation and with the fight for racial justice. On July 30, SMWC teamed up with the Maine State Nurses Association and Maine All Care for a rally, musical performance, and pie eating contest to celebrate the 50th anniversary of Medicare and Medicaid and to call for universal, publicly financed healthcare to include everyone. Looking ahead, in late September SMWC’s HCHR leadership team will hold its bi-annual retreat. The team will evaluate the campaign’s progress, set new campaign goals, and do a workshop to strengthen facilitation skills amongst the leadership. 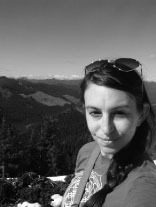 Healthcare Is a Human Right-Maryland (HCHR-MD) has hired Amy Woodrum, a resident of Annapolis, as its new campaign organizer. Amy became a member of HCHR-MD after getting involved in the campaign as a student at the University of Maryland School of Social Work in Baltimore. Before that, she worked as a proofreader at the Legislative Research Commission in her native Kentucky. It was there, says Amy, that she gained an understanding of and interest in how policies impact and shape people’s lives. As someone who was born with a hearing impairment, she has struggled to get the care she needs from the healthcare system, and is excited to connect with others in the campaign for a healthcare system that meets everyone’s needs. In the months to come, Amy will focus on building the HCHR campaign’s base by strengthening county committees, working with leaders to support their growth in the campaign, and developing a healthcare curriculum for a statewide leadership school. Welcome, Amy! At the end of May, Put People First! Pennsylvania (PPF-PA) members traveled together to Harrisburg to attend the free Mission of Mercy Dental Clinic. Some members were able to get needed dental care that they hadn’t been able to afford, and others spoke with people attending the clinic, listening to their healthcare stories and piloting a new survey that Put People First developed with support from NESRI. The survey is now in full swing. If you are a Pennsylvania resident, please share your healthcare experience by taking the survey online and sharing it with anyone you know in Pennsylvania. In June, PPF-PA hosted the members of the HCHR Collaborative for a two-day convening including two special events organized but Put People First members: a meet-and-greet barbecue for members of the different HCRH campaigns to get to know one another, and a strategic dialogue with some of PPF-PA’s key allies in Pennsylvania. 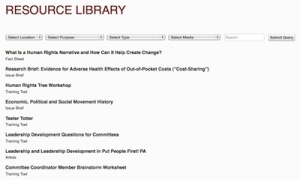 The entire convening was hosted by the Pennsylvania Brotherhood of Maintenance of Way Employees, and allies attending the dialogue included the Brotherhood as well as Media Mobilizing Project, the Faculty and Staff Federation of Community College of Philadelphia, the Pennsylvania Association of Staff Nurses & Allied Professionals, 15Now, and Healthcare 4 All PA.
PPF-PA has also been working with allies on a campaign connecting people whose lives have been impacted by mass incarceration, environmental injustice and racial and economic inequities. In the southwestern corner of the state, toxic coal ash from mining operations is leaking into the local water supply and poisoning thousands of people, including inmates of the SCI Fayette prison, prison workers and residents of the surrounding communities. 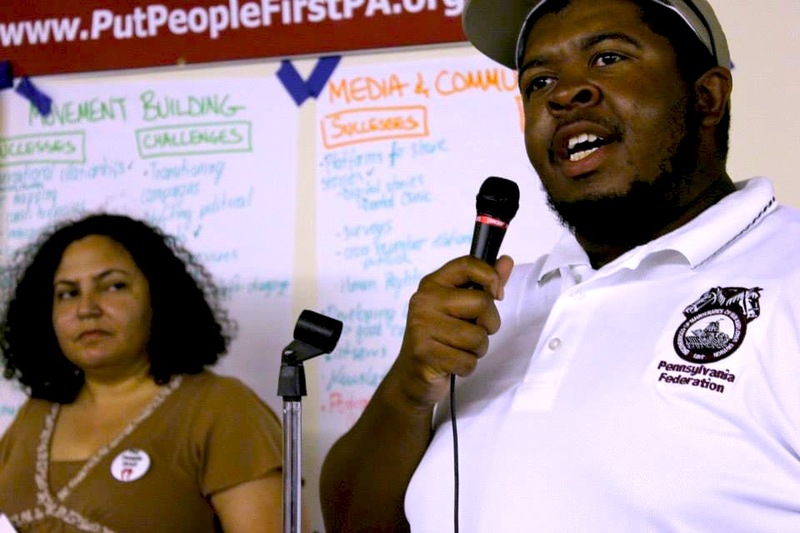 PPF-PA is working with Philadelphia residents who have been incarcerated at SCI Fayette and family members of people who are incarcerated, connecting them with the communities surrounding the prison and supporting them in advocating for their loved ones and protecting their human right to health. In August, several PPF-PA members from Southeastern Pennsylvania travelled to Fayette and neighboring counties to investigate and meet with people. Read an account of the visit from Bahjah, a PPF-PA member in Southwest Philadelphia whose son is in SCI Fayette, and a story from Richard, a PPF-PA member in Philadelphia who recounts the health problems he suffered during his time at Fayette. 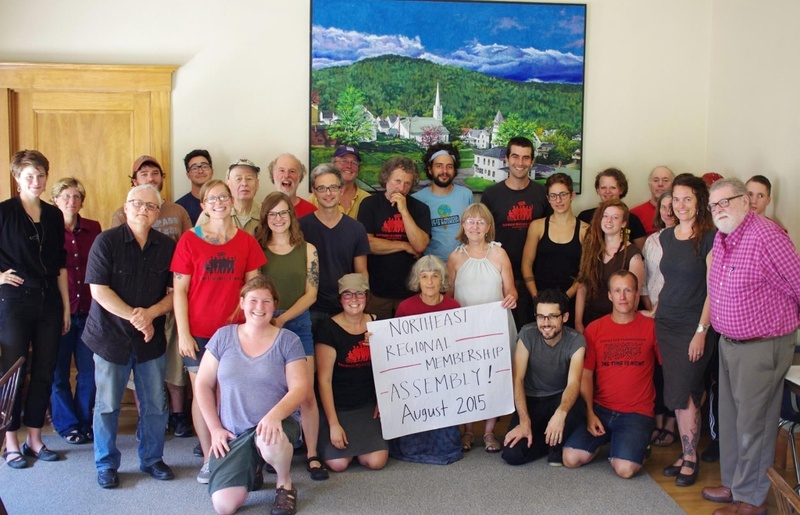 This summer the Vermont Workers’ Center is holding regional assemblies as part of a collective process to assess the successes and challenges of its groundbreaking Healthcare Is a Human Right campaign. Following an 8.6% average rate increase proposed by Blue Cross Blue Shield for next year’s health exchange plans, the campaign turned out dozens of members to a public hearing to speak out against the cost increases. Yet the insurance regulator agreed to a rate increase—albeit lower at 5.9%—and the campaign released a statement, which was picked up by local radio and newspaper outlets, that condemned the regulator’s failure to promote equitable access to healthcare. hospital’s board of trustees meeting and rallied outside of the medical center, helping the healthcare workers win a favorable contract. Internally, the Vermont Workers’ Center has set up a new leadership structure following the transition of James Haslam, the Workers’ Center’s long-time Executive Director, to start a new allied organization called Rights and Democracy. Rights and Democracy is a 501(c)4 lobbying organization that will work to get candidates elected who support universal, publicly financed healthcare and other policies meeting the needs of the people of Vermont. Veteran Vermont Workers’ Center organizers Kate Kanelstein, Megan Sheehan and Matt McGrath have stepped into the organization’s leadership. Working together as a team of co-directors, they are guiding the organization into its next phase. At the Workers’ Center going away party for James on August 29th, many members and leaders came to wish him well on the next leg of his work even as he and the Workers’ Center look forward to continuing their close collaboration. The Campaign for New York Health celebrated an important victory in June when it pushed the New York State Assembly to pass the New York Health Act, a bill for a universal, publicly financed healthcare system that would be paid for through equitable taxation and would ensure all residents of New York access to needed care regardless of their ability to pay, immigration status or any other factors. Though the bill did not pass the Senate, its passage in the Assembly was an important symbolic win that signaled widespread support for universal healthcare and the growing strength of the Campaign. The bill had been introduced to the Assembly in years past, but, as In These Times reports, some major unions stepped up to endorse the bill for the first time this year, a sign of a growing coalition behind universal healthcare. July 30 marked the 50th anniversary of Medicare and Medicaid, two critical public healthcare programs. To mark the occasion, activists organized dozens of events all over the country. Healthcare NOW!, National Nurses United (NNU), and Physicians for a National Health Program (PNHP) were among the lead organizers. The events included a rally on Capitol Hill in Washington, where Senator Bernie Sanders joined NNU and pledged to fight for a universal healthcare system that treats healthcare as a right, and a rally in Portland, Maine, co-organized by the Southern Maine Workers’ Center, Maine State Nurses Association and Maine All Care. Dr. Claudia Fegan, a past president of PNHP, was quoted emphasizing how critical public programs are to ensure racial and socioeconomic equity. “One of the most profound but under-appreciated contributions of Medicare to the well-being of our society,” said Fegan, “has been its role in reducing racial disparities in healthcare. As soon as it was enacted, Medicare began to close the gap between Black and White Americans aged 65 and older in access to care and in medical outcomes.” Fegan emphasized that achieving an equitable health system that provides high-quality healthcare to everyone regardless of race or socioeconomic status is an unfinished task, and one of the most important reasons to move from a market-based model to a universal, publicly financed healthcare system.